Crypto-critter or senior class prank? You decide. I might have some more Bigfoot stuff later. 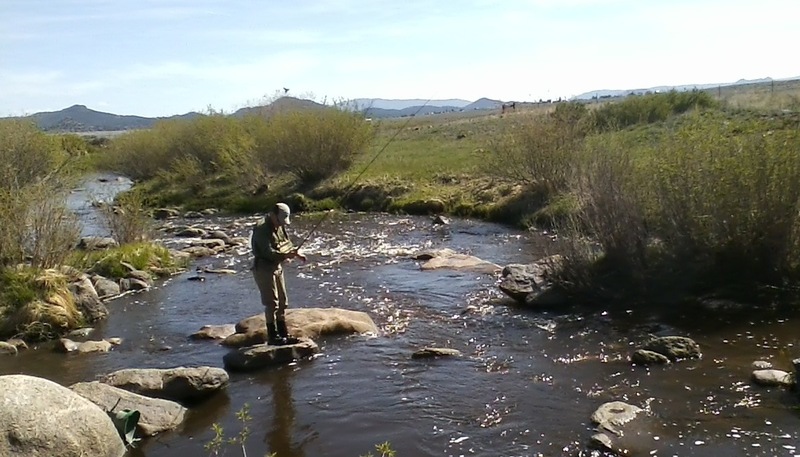 Crappy cell phone photo of Paul with his tenkara rod on Grape Creek near Westcliffe, Colorado. My friend Paul Vertrees is a cultist. A bumper sticker on his pickup truck says so — he follows the tenkara cult. Tenkara (from the skies) is a Japanese style of fly fishing in which the line is attached to the tip of the rod — no reel — and the angler depends on a combination of casting, wind, and current to put the fly (often a nymph or wet fly) in front of the fish. Of course, that is the way that everyone fished until some European invented the reel, first for storing line and later for playing the fish. I tell Paul that tenkara is just Izaak Walton in a kimono — or more accurately, Charles Cotton in a kimono — but he ignores my jibes. In casting your line, do it always before you, and so that your fly may first fall upon the water, and as little of your line with it as is possible; though if the wind be stiff, you will then of necessity be compelled to drown a good part of your line to keep your fly in the water: and in casting your fly, you must aim at the further, or nearer, bank, as the wind serves your turn: which also will be with and against you on the same side, several times in an hour, as the river winds in its course; and you will be forced to angle up and down by turns accordingly; but are to endeavour, as much as you can, to stand as far off the bank as your length will give you leave when you throw to the contrary side: though, when the wind will not permit you so to do, and that you are constrained to angle on the same side whereon you stand,---you must then stand on the very brink of the river, and cast your fly at the utmost length of your rod and line, up or down the river as the gale serves. That sounds pretty much like tenkara-style fly fishing to me. We fished a small creek together a couple of weeks ago, followed by a couple of hours on the Arkansas RIver. It is a clean, simple, and ultralight technique, and for small-stream fishing, it makes a lot of sense. In fact, I envied him when we were on the river, and while I was dragging streamers through a big slow bend, I had a spool mishap (a screw came out), causing the spool to fall off the reel unless I held the reel gangsta-style, on its side. Paul, meanwhile, was fishing upstream, following the old technique of breaking the river into smaller "streams," and he had no reel problems because he had no reel. Of course, like any other recreational activity that Americans take up, tenkara has its disputes between the purists and the innovators. Articles about tenkara technique are starting to show up in the fly-fishing magazines, although I doubt that it will be endorsed too whole-heartedly, because reel manufacturers are major advertisers. What, you don't need a $500 Ross reel? Heresy. Bill Gabbert at Wildlfire Today posts an interesting photo of yesterday's smoke plume from the Whitewater-Baldy fire in the Gila country of southwestern New Mexico. Our winds have shifted to the west, so the smoke is not as thick today here, but you can follow it on this University of New Mexico website. • Common agricultural chemical has multi-generational effect on rats, suggested as cause of rising autism rates, obesity. • To live today means balancing beauty and destruction: Chris Clarke on the Golden Gate Bridge. William Bailey was a Navy reservist when the United States entered World War 2. 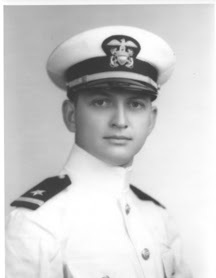 A college graduate (University of Kansas) employed by a large insurance firm, he was headed for intelligence work when he was first called up, but somehow ended up in the little-known Navy Armed Guard, commanding a detachment on the freighter SS Wichita. I don't know if that switch was a Navy decision, or if someone told him that by changing over, he could get to the war sooner. Since WW2 German submarines often attacked unarmed targets on the surface rather than submerged, the idea was that a four-inch deck gun on a merchant ship could hold them off. Sometimes it worked. It did not work for the SS Wichita in September 1942. Ensign Bailey and his (probably) green crew of gunners were outmatched by Gerhard Wiebe, skipper of U-516. The Wichita was lost with all hands. William Bailey was my stepmom's first husband. They were married for six months. When settling her estate, I found all the papers, etc., that she had saved, including correspondence from her struggle to collect on his life insurance. Because he was lost at sea, the government would not declare him officially dead until the war ended in 1945, so she did not get the money when she really needed it. I wrote a little piece about them for the Armed Guard website. They had no children, but if he has any relatives surviving, I would be happy to hand over everything to them. Today M. and I had the assignment of releasing a rehabilitated turkey vulture who had spent a few weeks at the raptor center. 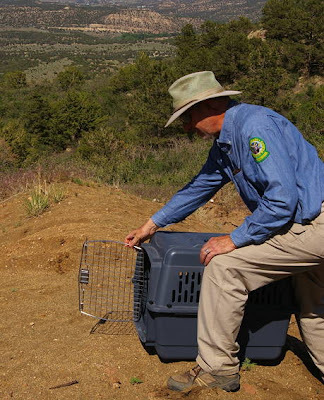 It had been captured in Cañon City after being hit by a car, but although it had some internal injuries and abrasions, it had been doing well, so the staff judged it ready to go. We decided to take it back to its former summer range. 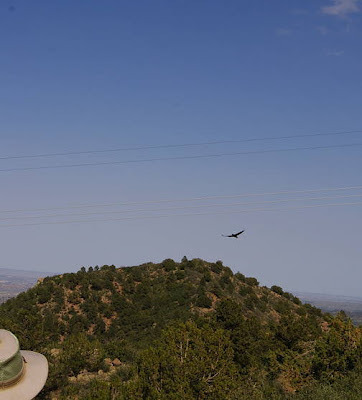 We let it go from an overlook on the Oak Creek Grade, for those readers who know Fremont County, and it was last seen soaring high toward the Royal Gorge — where I know there has been a large vulture roost in the past, although I have not looked lately. I put on the official Colorado Parks and Wildlife volunteer shirt in case someone stopped and asked, "What have you got there? What's in the carrier? You're not dumping your dog, are you?" Only one car went by, but did not stop. M. shot the photos. Meanwhile, the "stargazing owl" from ten days ago did not make it. The vet diagnosed a virus, possibly Newcastle disease. The bird's condition started to deteriorate, and it was euthanized. To be honest, they lose more injured birds than survive, which is why a release is always a happy event. Ok, vulture, this is your cue. 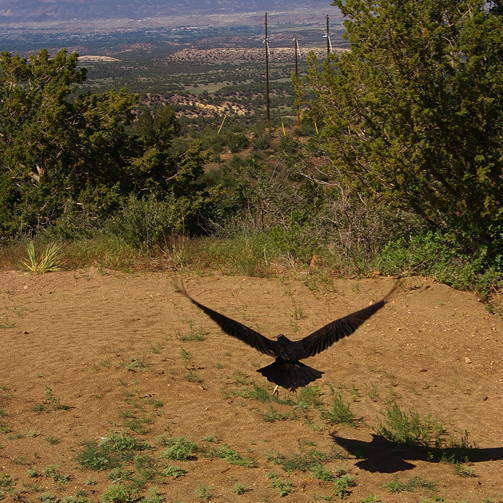 There goes the turkey vulture. Those are actually dark feathers reflecting light. Gaining altitude over the Oak Creek Grade. I read various articles on politics saying that Colorado is "in play" for the 2012 presidential election, like some extra effort will be made for our nine electoral votes, which went for Obama in 2008 but which might be pried loose by Gov. Romney this November. This is the one reach of the river that flows through roadless public lands (BLM and Forest Service on both sides). It's a wildly popular (i.e., often crowded) rafting/kayaking piece of water. About 20,000 acres would be designated. And at least some outfitters that I have talked to would love to be able to advertise a trip through a designated monument/wilderness area. 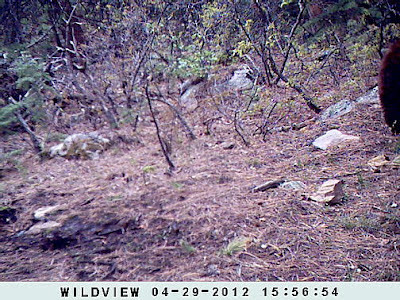 Colorado Senator Mark Udall has been conducting hearings in the area and making supportive noises. Ken Salazar did too, when he was senator. This issue has a history. The monument would still be administered by the Forest Service and BLM somehow, I am told, not by the National Park Service. There has been opposition from the drive-everywhere motorized-recreationists, but with whitewater rafting a big economic contributor to Chaffee County, the pro-monument people can point to economic benefits. But Congressman Doug Lamborn, in whose district the proposed monument lies, is not on board with this or any other new national monument or wilderness area. He is more in the "Drill, baby, drill" camp. So Congressional approval is unlikely. But the president has the power to create a monument under the Antiquities Act of 1906. President Clinton used that power toward the end of his final term. So did President Bush in 2006. In Clinton's case, creating monuments in Utah did not win him mass approval there, but it played well elsewhere. Likewise, President Obama has already used that power. Since Colorado is "in play" (and the Keystone Pipeline would not run through this state), how about another high-visibility monument designation to make Colorado environmentalists feel good about the current incumbent, who is lagging in some polls? Until 2009, dogs were believed to have been domesticated about 17,000 years ago, long after Neandertals were already extinct. Now some paleontologists are re-thinking that. None of these ancient dog skulls date exactly to the period of modern human–Neandertal overlap, but the domestication process must have been underway even before the first identifiable dog entered the fossil record. The rapidly developing consensus is that dogs were domesticated during the period when both modern humans and Neandertals [new spelling] lived in Europe. So far, all of these early dogs are from modern-human sites. 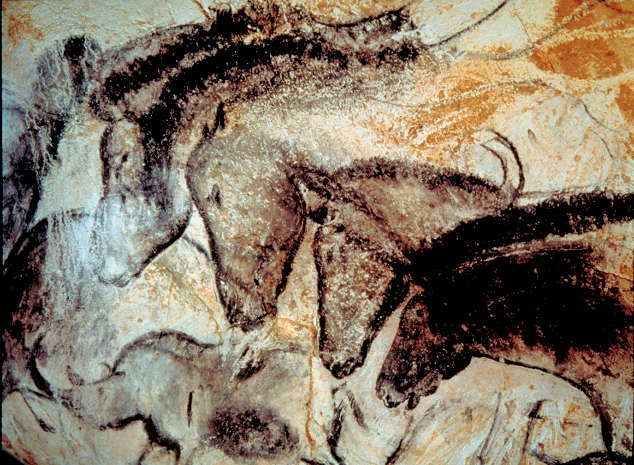 Several lines of evidence suggest that dogs and wolves were especially revered by those humans. The fire season could be "volatile," says the supervisor of the White River National Forest — which is, incidentally, Colorado's most heavily used forest for recreational purposes, thanks to the ski areas. Fitzwilliams and the [county] commissioners encouraged local residents to create “defensible space” around homes by clearing limbs and tinder. Information on what homeowners can do to protect themselves is available at www.firewise.org. He warned that some subdivisions in the county are so precariously placed, firefighters are unlikely to defend them in the event of a fire. For a technical briefing applicable to Colorado, Wyoming, and the Black Hills, watch this seven-minute video. La Niña is weakening; that is the good news. The bad news is the Western Slope snow pack at 20-25 percent of average. Western rattlesnake (Crotalis viridis) peers from the oak brush at the spring. We brought Fisher the Chesapeake Bay retriever with us, thus introducing the element of random anxiety and chaos that he always adds to any experience. Once he disappeared into the brush and came back carrying some dog's squeaky toy. How did that get up on the ridge? 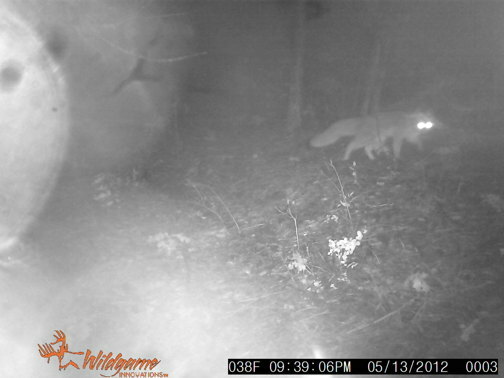 Did a fox bring it up there? At the spring, I was packing up the old batteries, etc., sitting on the ground, when M. started screaming at the dog. 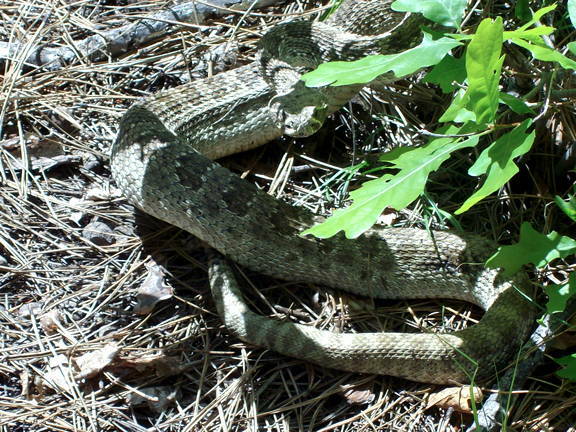 I jumped up, saw that he was prancing around something by the spring, saw that it was a snake — I was moving toward him — thought it was a bull snake like the one yesterday — saw the rattles — somehow leapt around the snake and grabbed his collar. We looked him over. He did not seem to have been bitten, nor had he yelped. So M. held him while I took pictures of the snake, well-camouflaged in the dappled light of the forest floor. We had walked within six feet of it ourselves. It was between two and three feet long. Maybe it found the spring to be a good hunting place for small mammals, and since it had not struck Fisher, perhaps it had a belly full of deer mouse or wood rat and had felt somewhat lethargic. It is more than three hours later now, and since he does not look like this, he was one lucky dog. As for photos, none were good enough for the blog, but a bear had been there. I think that I need to re-position the camera, so I will need to go back, doglessly. The US Department of the Interior, the Honorable Ken Salazar presiding, is expanding permits for wind farms' permissible chopping up of eagles. But look on the bright side. American Indians who have been complaining about how sluggish the feds are in filling their requests for eagle parts for ceremonial uses will now have more birds to choose from. More here. Vague mentions of "mitigation" and "conservation." Yet in California, tribal governments sue to stop wind farms. Life is complicated. Who are the "bad guys"? Cell phone picture of bull snake, taken while fishing this morning. 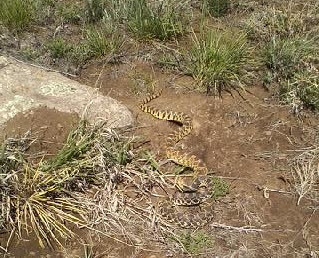 Bull snakes are victims of evolution, I reckon. Their stripe pattern is close enough to a rattlesnake that people see them and think, "Oh no, a rattlesnake." Then they vibrate their tails when annoyed, which sounds kind of like a rattlesnake's rattles, so people go, "Get the gun/shovel/hoe/implement of choice and kill it!" Really, they are quite beneficial. Unless you are a mouse. Or possibly a duck. Sorry about the photo quality. Someone left his pocket Pentax at home. You don't normally associate tornadoes with snow-capped mountain peaks, but two days ago the National Weather Service issued a warning for the western part of the county—big thunderstorm, rotation observed, etc. I happened to be looking at the Pueblo NWS radar map, and there was the red tornado trapezoid on top of the yellow trapezoid for the thunderstorm. What a surprise. It never really formed, although some people said that they saw the beginnings of a funnel cloud. Today I went up to the county seat for the monthly emergency services board meeting (I representing our little fire department), and of course the tornado was topic #1 on the agenda—specifically, how long to blow the town's emergency warning siren for such an usual event. At one point, the sheriff suggested letting it sound for as long as the Weather Service warning lasted. The emergency-services manager said that she had consulted some of her counterparts in High Plains counties, where they know about tornadoes, and that they often used a three-minute warning siren followed by a one-minute "all clear." Dad was an officer in a South Dakota National Guard anti-aircraft unit, tasked with defending Ellsworth AFB and Rapid CIty if the Soviet Air Force came over the North Pole and headed our way. He was also involved with some sort of Civil Defense work. So I had in my schoolboy's billfold (which rarely contained money) a card, red ink on white card stock, that explained all the different emergency siren tones—continuous, undulating, intermittent—and what you were supposed to do when you heard them. The siren could be for any threat—in 1972, after we left, a flash flood through the town killed more than two hundred people. But in my mind it would always sound for a squadron of Tupolev "Bear" bombers. In my 8-year-old's imagination, I was running (or bicycling) across the street from my school, up the gulley past the Methodist church, and across a half mile of prairie toward my house. Because it is better to be incinerated at home than at school? All that never happened, of course. When the siren down the highway from my house blows, it means just one thing: "Where is the fire?" But somehow the discussion brought back a little kid tearing (mentally) down a dirt road toward a yellow house with brown trim. As M. and I enter our third season as wildlife-transport volunteers (Wildlife Taxi, we call it around the house), we learn more about all the things that can go wrong. Friday's call came around 9 a.m. An owl was inside a building-supply store in a nearby town. The Raptor Center said that they had room for it, and M. was planning to go to Pueblo anyway, so we split up the trip, me to get the bird and then hand it off to her to take to the center. I walked into the store with my gauntlets and carrier, introduced myself to the cashier, and said, "I'm here to see Paul about an owl." Paul turned out to be the boss, and the bird — a great horned owl fledgling — was in the attached warehouse, huddled on the concrete floor behind next to some shelves. A forklift rolled past, trailing propane exhaust. Paul held the carrier, and I scooped up the young owl. Nothing felt broken. He said that owls nested on the high warehouse roof. The store is on the edge of town, with lots of open pasture around for the hunting of mice, prairie dogs, rabbits, and other prey. This one was out of the nest and had somehow crept into the warehouse. M. came home that afternoon and said that all was not well. The fledgling had a problem with "stargazing." Typically the muscles to the sides of the neck will be contracting causing a twitching and twisting if they contract singly, or pulling the head directly back pointing the beak to the sky if they contract together. The condition that can be caused by poor nutrition, injury, or other things. I talked with the center's director today. She was giving the owl vitamin supplements and said that it had a good appetite. Tomorrow it goes to the vet for X-rays and further examination. Sometimes afflicted birds have poor balance, so maybe that was why it was out of the nest. She said that she would give it a week to ten days to show improvement. Otherwise, that's the end of the trail. 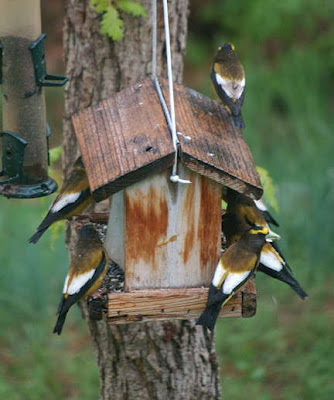 Grosbeaks in the rain insane. The snowpack in the southern Rockies is melting fast. The good news for some is that Colorado east of the Divide and the western High Plains has been a little damper this spring. See all snowpack maps here. • Seagull meets its match — an octopus. The last line of the piece reasserts the Great Chain of Being. • Am ambitious plan to connect islands of wildlife habitat in metro Denver with greenways. • Indians are unhappy with the bureaucratic delays at the National Eagle Repository. But what are the alternatives? • Here is the May Fire Potential Briefing for Colorado and Wyoming. Short version: Western Slope, scary; Eastern Slope and High Plains, not so bad, maybe. A map of fire potential for Arizona and New Mexico is here.